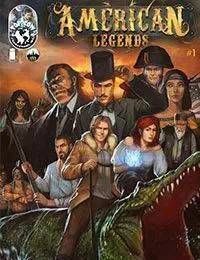 AMERICAN LEGENDS #1-5 – WEEKLY THROUGHOUT NOVEMBER! Depicting the extraordinary exploits of the legendary pioneers DAVY CROCKETT, MIKE FINK, and SALLY ANN THUNDER on a quest to save the Lewis &amp; Clark expedition and thwart a conspiracy hatched by Napoleon to destroy the promising future of a young American nation. Featuring a unique look at the Hatfields &amp; McCoys, Johnny Appleseed, Paul Bunyan, Sacagawea, and many, many more! These are the stories of the great frontiersmen who explored the magical and savage frontier before becoming mythical heroes in American folklore. These are the tall-tales of our youth, known and loved by all. These are the American Legends.